Rie Yoshitake is an experienced and versatile business consultant based in London. She has an impressive record over several decades of working with UK and Japanese businesses and markets, and has accumulated a large and unique network of contacts in media, diplomatic and cultural circles. Rie has been promoting sake and Japanese food and culture for many years and in recognition has been honoured with the Japanese Minister’s Award for Promoting Japanese Food Overseas. As the founder of Yoshitake & Associates, Rie has carefully selected specialists from a range of complementary fields to create her core team. She is now focused on working with these experts to provide a professional resource that combines cross-cultural and multifaceted skills and insights, to enhance existing Anglo-Japanese links and to promote new ones. 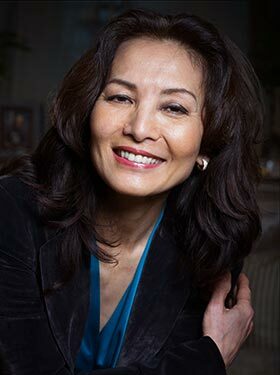 Rie began her business career in 1990 after studying international marketing and public relations in London. She then became the sole UK representative of a Japanese trading company and spent ten years overseeing their London operations, working across a range of markets focusing particularly on luxury goods and fine wine. In 2001 Rie became a founding partner of Claret Co. Ltd., which imports fine and rare wines to Japan. Rie’s extensive portfolio as a consultant includes work with governments, UK and Japan based organisations and businesses. Common to all her clients is a desire to create a liaison between the interests of Japan and Britain and their respective markets. This experience and her love of wine encouraged Rie’s involvement in promoting Japan’s sake industry overseas. In 2007 the Japan Sake Brewers Association Junior Council, also known as Sake Samurai, invited her to become their UK Representative. Rie has been working with the International Wine Challenge to arrange their prestigious annual Sake competition. She now also represents the Japan Sake and Shochu Makers Association and is recognised as the spokesperson for sake in the UK. Rie has worked with many organisations, including Sake Samurai Association (UK representative), International Wine Challenge (Ambassador for Japan), Claret Co Ltd Japan (Director & UK representative), Japan 400 (Steering Committee), Munakata ECO-100 International Forum (Goodwill Ambassador), Japan Sake and Shochu Makers Association (UK Liaison), The Embassy of Japan in UK, JETRO, MAFF Japan, Suntory, The East India Company, Marubeni, ADK, British-Japanese Parliamentary Group, Oxford University, Cambridge University, Japan Society, Marlon Abella Restaurant Corporation, BlackRock, Japanese Chamber of Commerce & Industry London, Japan Society, UBrain TV, Guardian Media, Urakasumi, Fukuoka and Kyushu local governments, sake and wine makers in Japan, and various charities.